Scryptcc is a new Scrypt-based Cloud Mining Service where you can purchase KHS and they will start mining alternative crypto currencies for you in the cloud right away. This service is really new and very similar to what CEX.io is for Bitcoin cloud mining, however here you re purchasing Scrypt processing power and not SHA-256 like with CEX. It seems that the service is just a few days old and although there is some polishing that needs to be made it seems fully operational and working with thousands of KHS already available for purchase. 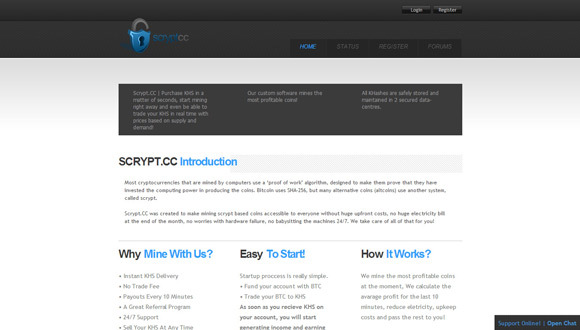 scryptcc offers both cloud mining and exchange for trading KHS, just like you can do on CEX.io with GHS and BTC. In this exchange you can purchase KHS for scrypt-based cloud mining in a private pool, and the earnings you get are also calculated in BTC. There is no detailed information yet or ability to control what alternative crypto currencies the pool mines for you, but it should mine based on profitability such as DOGE or LTC for example (in the future there should be an option for the user to choose specific coin to be mined). The current lowest exchange rate for a 1 KHS is 0.00144390 BTC and according to the calculator that the service provides for checking your profitability you should be able to get a return of investment for about 180 days or half a year if you purchase KHS at that price. The good thing about Scrypt mining is that there are not yet serious ASIC devices on the market and there are already a lot of alternative cryptos to mine, so longer term investment in Scrypt could mining seems more reasonable than in SHA-256 cloud mining power. We just started testing the scryptcc cloud based Scrypt mining service by purchasing a few KHS to test with, so we’ll keep you updated to what is happening and how things are going. Hopefully we are seeing something that will give some good alternative options for people that want to have access to higher Scrypt hashrate without having to deal directly with the hardware themselves. After you transfer some BTC to the service (only 3 network confirmations are required), you can purchase some Scrypt cloud hashrate on the exchange and the KHS you purchase are credited to your account and should start earning mining rewards every 10 minutes shortly. 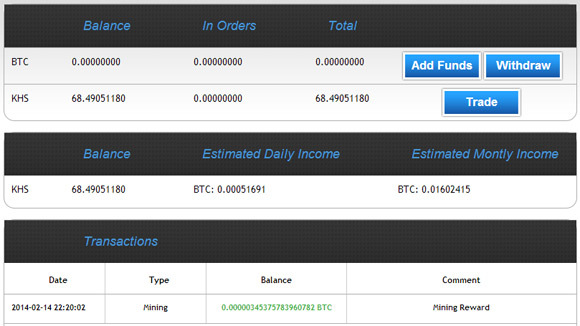 We just got our first small mining reward in BTC as you can see on the screenshot above that we reinvested into KHS. So we advice you to give the service a try with some small amount at first to see for yourself how things will be going as we decided to do. Have in mind that the service is still in Beta, so there could be some hiccups at first, but these will probably be dealt with quickly. This website is not secure send BTC and never received them, do not respond support any of my messages.